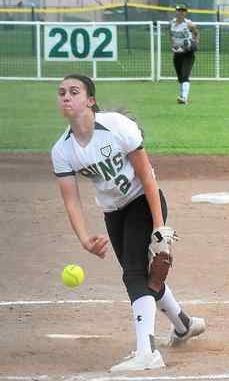 St. Patrick-St. Vincent High softball pitcher Cecily Kaluza throws a pitch during a game earlier this season. Kaluza has won three games in the postseason, helping the Bruins to the brink of the North Coast Section Division IV championship. Some things just always seem to go with other things. Apples and oranges. Freeways and traffic. Movies and popcorn. Libraries and books.St. Patrick-St. Vincent High softball and section championship games. Although making the North Coast Section Division IV final is no easy task, the Bruins are no stranger to being in the game. When No. 3-seeded St. Pat’s (19-8) takes the field at San Marin High on Saturday night at 7 p.m. against top-seeded Marin Catholic, it will be its fourth appearance for the Bruins in the last five years. The Bruins won a section title game with a 7-2 win over Salesian in 2012, but lost to the Pride in both 2013 and 2014. St. Pat’s has won section titles in 2012, 2009, 2008 and 2006 in the last 10 years. St. Pat’s finished second in the Tri-County Athletic League this season but have caught fire lately as the Bruins haven’t lost a game in nearly a month (May 6). After a two-week break St. Pat’s got healthy and for the first time the Bruins were fielding their entire squad. The result has been five wins in a row with the team averaging 11 runs a game. The Bruins come into Saturday’s game with seven hitters hitting at least .388 on the season. They are Jaydee Boursaw (.602), Olivia Soley (.471), Deijah Pangilinan (.468), Neenah Pangilinan (.437), Natayla Ocon (.427), Cydney Hampton (.392) and Marisa Avalos (.388). One of the strongest hitters lately for the Bruins has been Boursaw. Boursaw has hit a home run in all three playoff games, including a vital three-run shot to give St. Pat’s the lead over Cardinal Newman, and a two-homer game this week in a semifinals win against Fortuna. On the season Boursaw has 13 home runs and 12 doubles to go with her 51 RBIs. Boursaw said she’s just trying to make solid contact when she goes up the plate. The senior slugger will have the best seat in the house on Saturday as she handles the catching duties when St. Pat’s starter Cecily Kaluza is in the pitching circle. The senior hurler is 3-0 in the postseason and has thrown three complete games. Going up against Kaluza pitching-wise will most likely by Carly Slack, who has thrown well this year with a 16-2 record and 1.56 ERA. She has 16 complete games this year.